It was recently brought to my attention that I might have a small penchant for big wire arms. In light of this fact, I thought it might be a kick to do a micro wire 16D and see what happens. This would entail solderable 155C HPN red wire attached to the comm with HMP solder, and no HFE coating on the arm so you wouldn't need a powder coater or brazing setup. All acronyms aside, this should allow for a reasonably low buck build with minimal capital expenditures if it were to be replicated. Are you saying you plan to solder 27AWG ? If so, that won't work. I was confused, also, by the 27 AWG/micro comment. 27 AWG is the 5th biggest size used in slot racing. That's why I'm going to use solder. 1)Parts used for the arm...especially the com. 2)The wind...a classic "popsickle" wind (*as much wire as you can shmoosh on there with a popsickle stick) may help prolong the inevitable, but it also could speed it up (shorts). 3)Keeping the timing neutral or any advance very low can help. 4)The rest of the setup. The Mabuchi FDT16D, in stock form, was barely OK for #30 wire. I've done a LOT of way-too-aggressive winds on various motors with soldered com connections, static balancing AND no powder coat. 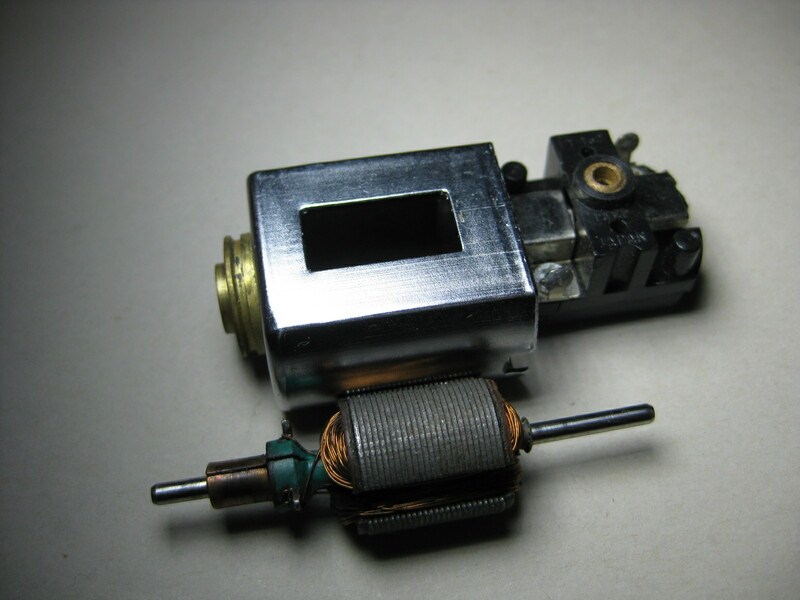 This all makes for a quick(er), easy and inexpensive way to see what works and learn about winding. Spinning such a motor with no load gives good results and instant feedback. Putting such a motor behind a load and running laps is a way different thing, and bound to result in a smokey conclusion. Still, I'd be the last person to not encourage this sort of thing, and these kinds of experiments can show how (relatively) easy it is to try some winding without investing much. How long did your motor last? Indulge my ignorance. Why would the arms quickly fail? Maurizio, I was referring to the un-powder coated and soldered comm rewinds. Geary, are you planning to use an external flux with the HMP solder or will you be relying on the active rosin cored flux? I remember rewound arms in the late '60s from Howkill, on the north shore of Boston. I'd think their coms were soldered with some type of solder They wound singles, doubles, & a few odd wind triples for 16D & 36D motors. The ones I recall seeing run either ran very well or they immediately let out the smoke. When the motor heats up, it will either throw the solder off the comm tabs, or the wire will swell, pull around the corners of the armature leg cut through the insulation on the magnet wire, and it will short. I never heard mention of or thought of the windings swelling. That makes total sense. But the arm leg swells as well, right? I guess not as fast as the coils, allowing them to slip. I assume the the main problem with armature leg is the corners. Why not just round and smooth the sharp edge? 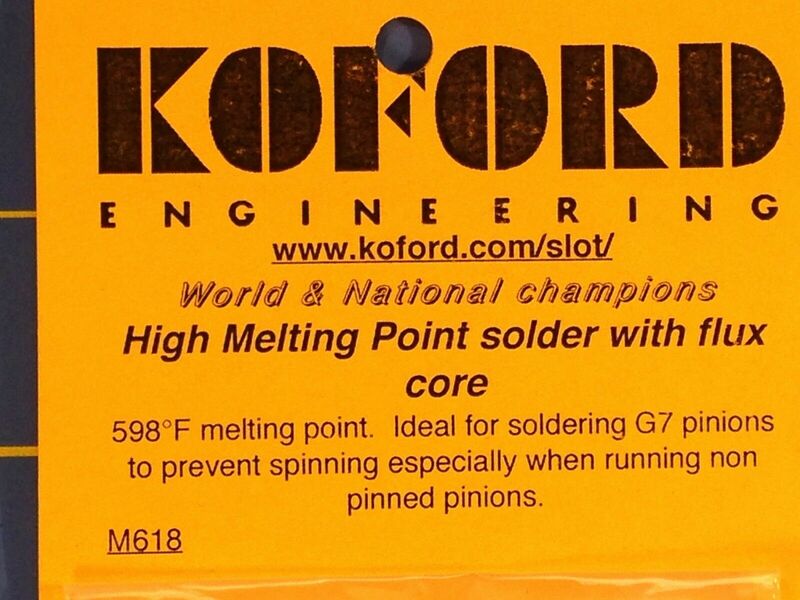 I bought some Koford high temp solder specidically for rewinding. I think the melt temp is something like 500 degrees. Will that hold up? I did some arms upto #25 with soldered tabs. But it was "comm solder" and did melt at about 570 °F - no arm did throw the wire but they did swell quite a lot. Boys did win a couple of Finnish Championships with them in a class where rewounds were legal. And the class was finished soon as other guys were doing just #27 - #30 winds and were badly beaten. Yep, a lot of factors play in the equation! The solder is certainly a critical aspect because of the difficulty of realizing it well (only a fleeting touch with the very hot ungar). As for the lack of powder coat at the time there were still the phenolics at the top and bottom of the stack so that if you had a short you discovered almost immediately. 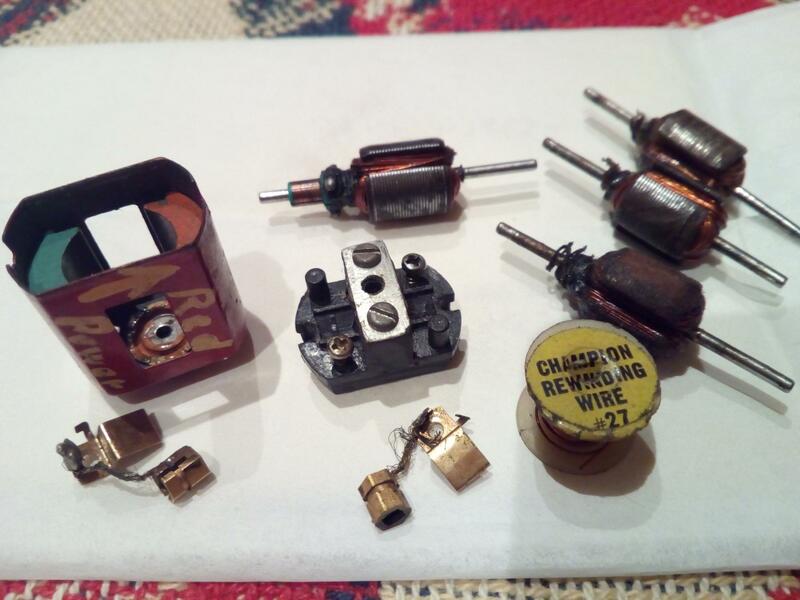 Winding a neat coil and resistance welding the commutator tab are two the most challenging aspects of producing your own armature. Geary, you are making some really nice coils!! when welding the commutator tabs. I am not just saying this, it's from hard experience. It is easier than ever to buy of build your self a resistance welding rig for the commutator tabs. There is a large community out there of folks who build large battery banks out of 18650 lithium cells like those from a laptop computer. They use a resistance welding rig (spot elder) that can work with slot car armatures. You can search u -Tube or ebay and buy or build one. The key to it all is to practice until you can get a wound commutator tab hot enough to melt silver, red hot about 1100 degrees F. without arcing the electrode. Do not use commutators for this practice, but pound some copper wire to the shape and size of a commutator tab, wind some wire around it and go for it. Do it again and again. Develop your technique and try different electrode materials until you are sure you can make a good weld. You can do this, Geary. Go for it! This is really thought provoking. I had to look into it more. Copper also might start expanding at a lower temp as well, but I didn't look it up. So it at least worked for you, and with great success. That's encouraging. See Bill Bugenis' post above for encouragement, see Mike Swiss' post for what can and *will* go wrong. Trust me, I've been down this road many times...AND with the attitude that says "if I didn't see it myself, it didn't happen". The HMP solder is rosin activated muticore, 565 / 574°F...Solidus / Liquidus. Today, on 13-14V, that arm against a current Koford arm, or at least against a 25 wire arm that was hysoled, and welded, what would be your % chance of winning? Hey Geary, the Koford solder I bought is similar. I silver braze and use HFE on all my arms but this exercise was for designed for anyone that might want to try rewinding without the need for a brazing or powder coating setup. This build is essentially for the fun factor.